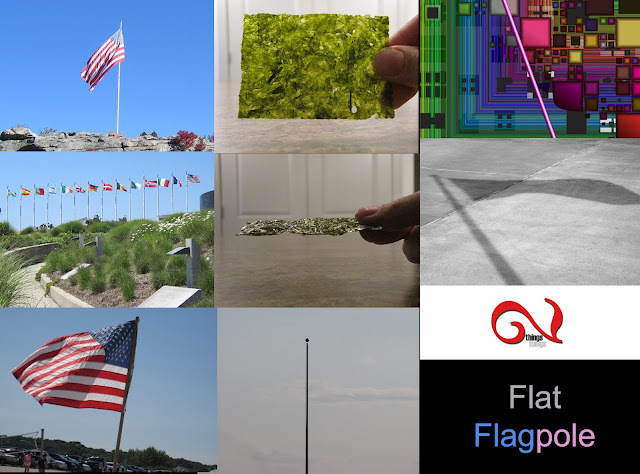 Our challenge this week was Flat/Flagpole. Let's face it, a flag is a flag and a flagpole is a flagpole, so it's kind of hard to be really creative with this one, but the "always empty" flagpole in front of an ongoing business that sells flags bothers me a little bit. Great job folks and thanks to all. Interpretations came from Vivian, Mouse, Diane, and Eeyore. If I missed anyone, please leave me a comment and I'll post your link as well. Interpret the 2 weekly subjects any way you wish, in a photograph, collage, painting, poem, song, or whatever you can dream up and post on your blog. When done, leave a comment here to let us know. Please keep the material family-friendly.